On 21 November 1974 two explosions took place in two public houses in Birmingham City Centre, the 'Mulberry Bush' and the 'Tavern in the Town' ('the Birmingham bombings'). 21 people were killed and some 220 injured, many of them seriously. A third bomb placed at a Barclays Bank branch on Hagley Road, Birmingham, was defused on the same evening. It was the worst peacetime atrocity in British history to that date. The Provisional IRA ('PIRA') is generally regarded as having been responsible for it. pending criminal proceedings against "the Birmingham Six" as they came to be known. Their trial at Lancaster Castle before Bridge J and a jury was looked at in this earlier post. In 1991, the Six were released after their third appeal resulted in their convictions being quashed - see R v McIlkenny, Hill, Power, Walker, Hunter and Callaghan  EWCA Crim 2 - Lloyd, Mustill and Farquharson LJJ. 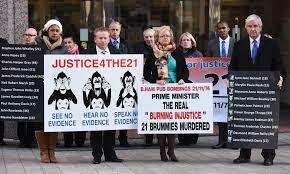 It was not until 1st June 2016 that the Senior Coroner in Birmingham ruled that the inquests should be resumed. Sir Peter Thornton QC ('the Coroner') was appointed by the Lord Chief Justice as the coroner to conduct the Inquests. In early pre-inquest review hearings, he ruled that the Inquests would comply with the procedural requirements of Article 2 of the European Convention on Human Rights and Fundamental Freedoms and would be held with a jury. It is set down in Act of Parliament that the function of an inquest is to ascertain (a) who the deceased was; (b) how, when and where the deceased came by his or her death; and (c) the particulars (if any) required by law to be registered concerning the death. Where necessary in order to avoid a breach of any Convention rights (within the meaning of the Human Rights Act 1998) the "how, when and where" question (sub-para b) is to be read as including the purpose of ascertaining in what circumstances the deceased came by his or her death. The word "circumstances" makes the Coroner's investigation much wider than it would otherwise be but a key question in this inquest arose because, perfectly understandably, the relatives of the victims wish to find out who the perpetrators actually were if it is possible to do so. Submissions as to the scope of the resumed Inquests were made between 23 February and 29 June 2017. On 3 July 2017 the Coroner ruled, amongst other things, that investigation into the identity of the suspected perpetrators ('the Perpetrator Issue') would not be dealt with as part of the inquiry. 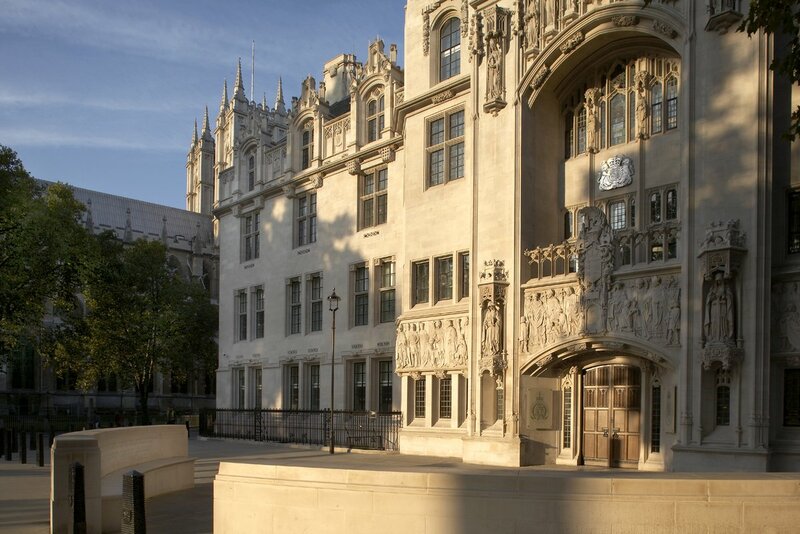 This ruling was challenged by way of judicial review in the High Court and the court's judgment (Salmon LJ and Carr J) may be read via Bailii - here. The claimants argued that in reaching his decision to exclude an investigation into the Perpetrator Issue, the Coroner misdirected himself. The question that arose under the relevant legislation was whether the factual issue of the identity of the bombers (and those that assisted them) was sufficiently closely connected to the deaths to form part of the circumstances of the deaths. Instead of answering this question, the Coroner approached the Perpetrator Issue on the basis that it was a matter for his discretion; and in any event omitted relevant considerations, and took into account irrelevant considerations, in exercising his discretion. The High Court agreed with the claimants on this and proceeded to set down some guidance (para 35) to assist the Coroner who must now reconsider the question in the light of the High Court's judgment. The court said that the Coroner need not feel under an obligation to give an immediate further decision on scope since he might wish to update himself on any West Midlands Police report and may wish to invite further observations on the point. A further challenge was based on the European Convention of Human Rights. The claimants submitted that the decision not to investigate who was responsible for the Birmingham bombings was incompatible with the state's procedural obligation under article 2 of the ECHR. Having acknowledged that the Inquests were to be article 2 compliant, and in the absence of any other mechanism where by the investigative obligation would be discharged, they argued that the Coroner had no discretion to decline to perform the obligation. Whatever form the state's investigation took, certain minimum standards have to be met. Against this it was argued that it was for the Coroner to identify the central issues in the case and then to decide in the exercise of his discretion how best to elicit the jury's conclusion on those issues. On this basis, it was open to the Coroner to confine the inquiry into the cause of death so as to exclude identification of the individual perpetrators. The court said (paras 50 - 53) - "A State may clearly discharge its procedural obligation under article 2 in different ways. The fact-finding and accountability components of the investigative obligation may be shared between authorities, including coronial and criminal authorities, provided they are procedurally effective in totality .... Where the State is alleged to be involved in a homicide, compliance with article 2 will require an investigation initiated by the State that is (a) independent, (b) effective and (c) prompt and proceeds with reasonable expedition, (d) is subject to a sufficient degree of public scrutiny to ensure accountability and (e) involves the next of kin to an appropriate extent ..... In the present case, there are allegations of state involvement in the Birmingham bombings ... but these issues are expressly within the scope of the Inquests. In our view neither the domestic nor the ECtHR authorities lead to the conclusion that the procedural requirement under article 2 requires the Inquests to investigate the identity of the persons responsible for the Birmingham bombings. That is the role of the police who continue to investigate this issue in so far as they are able to do so." The claimants failed on this ground. Therefore there was a partial success for the claimants but it does not necessarily follow that the Coroner will now definitely engage in an investigation into the identity of the suspected perpetrators. It will be necessary to see how the matter develops as the inquests proceed and the Coroner has stated that the issue will be kept under review. The families were eventually granted legal aid for the inquests - BBC News 4th May 2017. However, it is reported that they were refused legal aid for the judicial review - Birmingham Mail 14th November 2017. In practice, families wishing to be represented at inquests face formidable problems in obtaining legal aid for representation even though publicly funded bodies (e.g. the Police) are invariably represented. The Lord Chancellor has issued guidance relating to exceptional funding for legal representation at inquests. The guidance states - "Funding for representation at an inquest is not generally available because an inquest is a relatively informal inquisitorial process. rather than an adversarial one." That statement does not withstand serious analysis given the complexities of Coronial Law let alone the difficulties which the evidence may present during the inquest. The guidance continues by noting that - "There are two grounds for granting legal aid ... the first is that is required by Article 2 ECHR ... the second is where the Director makes a "wider public interest determination" in relation to the individual and the inquest.